Twenty- and 50-round boxes of Littlestone Ammunition's loading of the .380 ACP cartridge with 80-grain Barnes TAC-XP Solid Copper Hollow Point bullets. Hover cursor or click on photo for close-up view. Firearm not included. 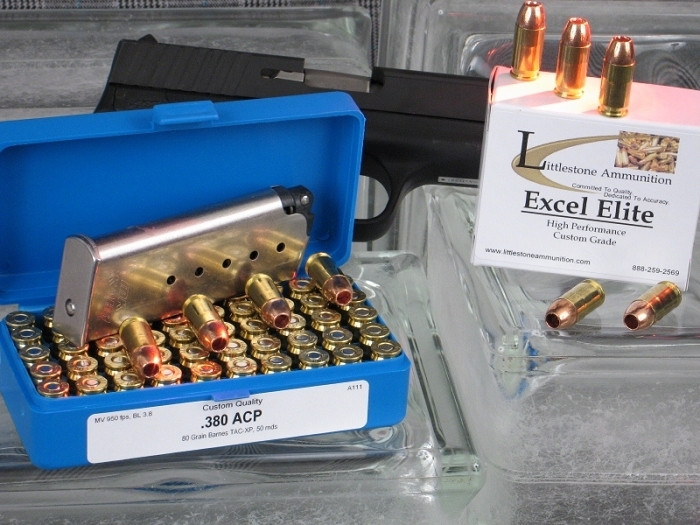 This 50 rounds of Excel Elite Custom Quality .380 ACP ammunition from Littlestone Ammunition is topped with the solid copper Barnes TAC-XP bullet and travels at a muzzle velocity of 950 feet per second. The solid copper bullet gives great penetration for this caliber and is renowned for its accuracy. In ballistic gelatin this load penetrates 9-10 inches and expands to .60 inches, transforming this historically underpowered and inconsistently performing round into a viable defensive cartridge that can be packaged in a very concealable platform. The Barnes X bullet for handguns is a homogeneous solid copper bullet that combines accuracy, power and exceptional penetration. The handgun X bullet comes in two versions, the TAC-XP and the XPB. The designations refer to their expected use, either personal defense or hunting, as there are no differences in the basic construction of these hollow point bullets. Barnes handgun X bullets are known for three noteworthy traits: accuracy, penetration, and the six razor sharp petals that peel back from the bullet s nose upon impact and create a cutting wound that promotes bleeding and energy delivery. The accuracy and penetration both arise from the solid copper construction. Because these bullets are of a single material rather than two, such as a more traditional copper jacket over a lead core, the weight is more evenly distributed throughout the bullet, reducing or eliminating any out-of-balance wobble that can reduce accuracy. Penetration is exceptional because the solid copper bullets virtually always retain 100% of their weight upon impact. Traditionally built bullets can shed as much as 50% of their original weight as they expand and travel through the target. With equal velocity, a heavier hollow point bullet typically will penetrate further than a lighter bullet of the same caliber. X bullets arriving on target with reasonable velocity usually expand to about twice their original diameter, delivering tremendous hydrostatic shock (shock waves through tissue) and energy on target. Because of their retained weight, they often travel further through the target, often completely through, causing superior bleeding and, for hunters, easier tracking if necessary. They are known for their ability to penetrate automobile windshield glass and doors. Finding that load can be expensive if you have to buy a full box of 20 or 50 rounds for every type you want to try. Which is why we developed our sample pack system. With one purchase of 20 or 50 rounds, you can test either four or five different loads, helping you find ammo that meets all your needs much more economically. Each of our sample packs comes complete with the written load number record of each load in the pack, and a color-coded test-fire evaluation form. So you might consider testing one or more of our sample packs containing this bullet, which can be found in a variety of the Sample Pack product listings for this cartridge. After you test one or more sample packs, if you and your gun like the load, come back and purchase it in greater quantities. Of course, if you prefer, use the "Add To Cart" button above to purchase this 50 rounds of Littlestone Ammunition now. Feature 3: MV / Energy / Barrel: 950 fps / 160 ft lbs / 3.7"